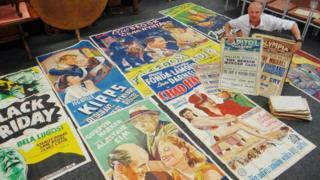 A collection of classic Hollywood cinema posters found in perfect condition after being used as a carpet underlay for decades are to be sold. The 70 prints featuring Alfred Hitchcock, Sir Laurence Olivier, Henry Fonda and John Wayne were used in Cardiff cinemas from 1936 to 1940. But two builders later stumbled upon them while renovating the home of a late cinema owner in Penarth in 1985. They have been put up for auction but are so rare there is no guide price. The posters, which are up to 3m (10ft) tall, were turned into makeshift underlay after once being used in the New Theatre, Capitol, Empire and Olympia cinema theatres. They include Alfred Hitchcock's second Hollywood feature, Foreign Correspondent, in 1940 and John Wayne's breakthrough film, Stagecoach, in 1939. Also included is Fire Over England, the first British film to have its premiere in Los Angeles and the first to pair together Hollywood stars Sir Laurence Olivier and Vivien Leigh in 1937. They have been kept in pristine condition after being found by the builders. Now film fans are to be given the chance to own them as they go up for auction next month. Auctioneer Ben Rogers Jones, of Rogers Jones & Co, said valuing the posters was "nearly impossible" because there was no comparison "in terms of titles, condition and size of some of them". "It wasn't just the sheer volume of them that was impressive but the condition was fantastic considering their age and the imposing size of the 12-sheet posters," he added.